Just like a push pop, but for eyes ! Three creamy, bright, fruity shades in one stackable tube. This eyeshadow trio is a fabntastric idea,handy to pop into your bag for makeup on the go. The colours are on trend and really easy to apply thanks to the crayon. 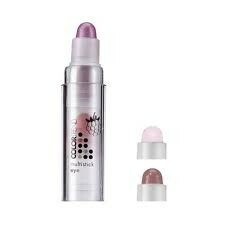 when you want another colour you pull the top colour out and press it into the bottom to push the next colour up. The colours are lovely but are quite shimmery. They are fun to apply and blend with your finger. probably not that great if you want a more proffesional look though,but great for the day and touching up. "This eyeshadow trio is a fabntastric idea,handy to pop into your bag for makeup on the go. The colours are on trend and really easy..."